This is a daily, global Sea Surface Temperature (SST) data set produced on December 20th, 2013 at 1-km resolution (also known as ultra-high resolution) by the JPL ROMS (Regional Ocean Modeling System) group. Weekly average sea surface temperature for the World Ocean during the first week of February 2011, during a period of La Niña. Sea surface temperature and flows. Ocean temperature is related to ocean heat content, an important topic in the debate over global warming. Coastal SSTs can cause offshore winds to generate upwelling, which can significantly cool or warm nearby landmasses, but shallower waters over a continental shelf are often warmer. Onshore winds can cause a considerable warm-up even in areas where upwelling is fairly constant, such as the northwest coast of South America. Its values are important within numerical weather prediction as the SST influences the atmosphere above, such as in the formation of sea breezes and sea fog. It is also used to calibrate measurements from weather satellites. There are a variety of techniques for measuring this parameter that can potentially yield different results because different things are actually being measured. Away from the immediate sea surface, general temperature measurements are accompanied by a reference to the specific depth of measurement. This is because of significant differences encountered between measurements made at different depths, especially during the daytime when low wind speed and high sunshine conditions may lead to the formation of a warm layer at the ocean's surface and strong vertical temperature gradients (a diurnal thermocline). Sea surface temperature measurements are confined to the top portion of the ocean, known as the near-surface layer. SST was one of the first oceanographic variables to be measured. Benjamin Franklin suspended a mercury thermometer from a ship while travelling between the United States and Europe in his survey of the Gulf Stream in the late eighteenth century. SST was later measured by dipping a thermometer into a bucket of water that was manually drawn from the sea surface. The first automated technique for determining SST was accomplished by measuring the temperature of water in the intake port of large ships, which was underway by 1963. These observations have a warm bias of around 0.6 °C (1 °F) due to the heat of the engine room. This bias has led to changes in the perception of global warming since 2000. Fixed weather buoys measure the water temperature at a depth of 3 metres (9.8 ft). Measurements of SST have had inconsistencies over the last 130 years due to the way they were taken. In the nineteenth century, measurements were taken in a bucket off of a ship. However, there was a slight variation in temperature because of the differences in buckets. Samples were collected in either a wood or an uninsulated canvas bucket, but the canvas bucket cooled quicker than the wood bucket. The sudden change in temperature between 1940 and 1941 was the result of an undocumented change in procedure. The samples were taken near the engine intake because it was too dangerous to use lights to take measurements over the side of the ship at night. Many different drifting buoys exist around the world that vary in design, and the location of reliable temperature sensors varies. These measurements are beamed to satellites for automated and immediate data distribution. A large network of coastal buoys in U.S. waters is maintained by the National Data Buoy Center (NDBC). Between 1985 and 1994, an extensive array of moored and drifting buoys was deployed across the equatorial Pacific Ocean designed to help monitor and predict the El Niño phenomenon. 2003–2011 SST based on MODIS Aqua data. The satellite-measured SST provides both a synoptic view of the ocean and a high frequency of repeat views, allowing the examination of basin-wide upper ocean dynamics not possible with ships or buoys. NASA's (National Aeronautic and Space Administration) Moderate Resolution Imaging Spectroradiometer (MODIS) SST satellites have been providing global SST data since 2000, available with a one-day lag. NOAA's GOES (Geostationary Orbiting Earth Satellites) satellites are geo-stationary above the Western Hemisphere which enables to them to deliver SST data on an hourly basis with only a few hours of lag time. There are several difficulties with satellite-based absolute SST measurements. First, in infrared remote sensing methodology the radiation emanates from the top "skin" of the ocean, approximately the top 0.01 mm or less, which may not represent the bulk temperature of the upper meter of ocean due primarily to effects of solar surface heating during the daytime, reflected radiation, as well as sensible heat loss and surface evaporation. All these factors make it somewhat difficult to compare satellite data to measurements from buoys or shipboard methods, complicating ground truth efforts. Secondly, the satellite cannot look through clouds, creating a cool bias in satellite-derived SSTs within cloudy areas. 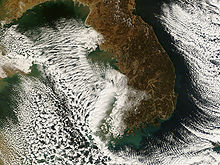 However, passive microwave techniques can accurately measure SST and penetrate cloud cover. Within atmospheric sounder channels on weather satellites, which peak just above the ocean's surface, knowledge of the sea surface temperature is important to their calibration. The SST has a diurnal range, just like the Earth's atmosphere above, though to a lesser degree due to its greater specific heat. On calm days, the temperature can vary by 6 °C (10 °F). The temperature of the ocean at depth lags the Earth's atmosphere temperature by 15 days per 10 metres (33 ft), which means for locations like the Aral Sea, temperatures near its bottom reach a maximum in December and a minimum in May and June. Near the coastline, offshore winds move the warm waters near the surface offshore, and replace them with cooler water from below in the process known as Ekman transport. This pattern increases nutrients for marine life in the region. Offshore river deltas, freshwater flows over the top of the denser seawater, which allows it to heat faster due to limited vertical mixing. 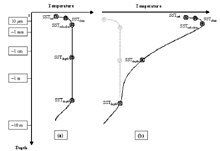 Remotely sensed SST can be used to detect the surface temperature signature due to tropical cyclones. In general, an SST cooling is observed after the passing of a hurricane primarily as the result of mixed layer deepening and surface heat losses. In the wake of several day long Saharan dust outbreaks across the adjacent northern Atlantic Ocean, sea surface temperatures are reduced 0.2 C to 0.4 C (0.3 to 0.7 F). Other sources of short-term SST fluctuation include extratropical cyclones, rapid influxes of glacial fresh water and concentrated phytoplankton blooms due to seasonal cycles or agricultural run-off. The sign of an El Niño in the sea surface temperature pattern is when warm water spreads from the west Pacific and the Indian Ocean to the east Pacific. It takes the rain with it, causing extensive drought in the western Pacific and rainfall in the normally dry eastern Pacific. El Niño's warm rush of nutrient-poor tropical water, heated by its eastward passage in the Equatorial Current, replaces the cold, nutrient-rich surface water of the Humboldt Current. When El Niño conditions last for many months, extensive ocean warming and the reduction in Easterly Trade winds limits upwelling of cold nutrient-rich deep water and its economic impact to local fishing for an international market can be serious. Sea surface temperature affects the behavior of the Earth's atmosphere above, so their initialization into atmospheric models is important. While sea surface temperature is important for tropical cyclogenesis, it is also important in determining the formation of sea fog and sea breezes. Heat from underlying warmer waters can significantly modify an air mass over distances as short as 35 kilometres (22 mi) to 40 kilometres (25 mi). For example, southwest of Northern Hemisphere extratropical cyclones, curved cyclonic flow bringing cold air across relatively warm water bodies can lead to narrow lake-effect snow (or sea effect) bands. Those bands bring strong localized precipitation, often in the form of snow, since large water bodies such as lakes efficiently store heat that results in significant temperature differences—larger than 13 °C (23 °F)—between the water surface and the air above. Because of this temperature difference, warmth and moisture are transported upward, condensing into vertically oriented clouds which produce snow showers. The temperature decrease with height and cloud depth are directly affected by both the water temperature and the large-scale environment. The stronger the temperature decrease with height, the taller the clouds get, and the greater the precipitation rate becomes. Ocean temperature of at least 26.5°C (79.7°F) spanning through at minimum a 50-metre depth is one of the precursors needed to maintain a tropical cyclone (a type of mesocyclone). These warm waters are needed to maintain the warm core that fuels tropical systems. This value is well above 16.1 °C (60.9 °F), the long term global average surface temperature of the oceans. However, this requirement can be considered only a general baseline because it assumes that the ambient atmospheric environment surrounding an area of disturbed weather presents average conditions. Tropical cyclones have intensified when SSTs were slightly below this standard temperature. At the 500 hPa level, the air temperature averages −7 °C (18 °F) within the tropics, but air in the tropics is normally dry at this height, giving the air room to wet-bulb, or cool as it moistens, to a more favorable temperature that can then support convection. A wetbulb temperature at 500 hPa in a tropical atmosphere of −13.2 °C (8.2 °F) is required to initiate convection if the water temperature is 26.5 °C (79.7 °F), and this temperature requirement increases or decreases proportionally by 1 °C in the sea surface temperature for each 1 °C change at 500 hpa. Inside a cold cyclone, 500 hPa temperatures can fall as low as −30 °C (−22 °F), which can initiate convection even in the driest atmospheres. This also explains why moisture in the mid-levels of the troposphere, roughly at the 500 hPa level, is normally a requirement for development. However, when dry air is found at the same height, temperatures at 500 hPa need to be even colder as dry atmospheres require a greater lapse rate for instability than moist atmospheres. At heights near the tropopause, the 30-year average temperature (as measured in the period encompassing 1961 through 1990) was −77 °C (−132 °F). A recent example of a tropical cyclone that maintained itself over cooler waters was Epsilon of the 2005 Atlantic hurricane season. ^ a b c d e Vittorio Barale (2010). Oceanography from Space: Revisited. Springer. p. 263. ISBN 978-90-481-8680-8. ^ Alexander Soloviev; Roger Lukas (2006). The near-surface layer of the ocean: structure, dynamics and applications. The Near-Surface Layer of the Ocean: Structure. シュプリンガー・ジャパン株式会社. p. xi. Bibcode:2006nslo.book.....S. ISBN 978-1-4020-4052-8. ^ William J. Emery; Richard E. Thomson (2001). Data analysis methods in physical oceanography. Eos Transactions. 80. Gulf Professional Publishing. pp. 24–25. Bibcode:1999EOSTr..80..106J. doi:10.1029/99EO00074. ISBN 978-0-444-50757-0. ^ Michael Marshall (2010-11-16). "Ships and buoys made global warming look slower". New Scientist. Retrieved 2011-01-29. ^ Burroughs, William James (2007). Climate change : a multidisciplinary approach (2. ed.). Cambridge [u.a. ]: Cambridge Univ. Press. ISBN 9780521690331. ^ Vittorio Barale (2010). Oceanography from Space: Revisited. Springer. pp. 237–238. ISBN 978-90-481-8680-8. ^ K. A. Browning; Robert J. Gurney (1999). Global energy and water cycles. Cambridge University Press. p. 62. ISBN 978-0-521-56057-3. ^ National Research Council (U.S.). NII 2000 Steering Committee (1997). The unpredictable certainty: information infrastructure through 2000; white papers. National Academies. p. 2. ^ W. J. Emery; D. J. Baldwin; Peter Schlüssel & R. W. Reynolds (2001-02-15). "Accuracy of in situ sea surface temperatures used to calibrate infrared satellite measurements" (PDF). Journal of Geophysical Research. 106 (C2): 2387. Bibcode:2001JGR...106.2387E. doi:10.1029/2000JC000246. Archived from the original (PDF) on 2011-07-21. Retrieved 2011-01-09. ^ a b John Maurer (October 2002). "Infrared and microwave remote sensing of sea surface temperature (SST)". University of Hawai'i. Retrieved 2011-01-09. ^ C. M. Kishtawal (2005-08-06). "Meteorological Satellites" (PDF). Satellite Remote Sensing and GIS Applications in Agricultural Meteorology: 73. Retrieved 2011-01-27. ^ Robert Harwood (1971-09-16). "Mapping the Atmosphere From Space". New Scientist. 51 (769): 623. ^ David E. Alexander; Rhodes Whitmore Fairbridge (1999). Encyclopedia of environmental science. Springer. p. 510. ISBN 978-0-412-74050-3. ^ Ian Stuart Robinson (2004). Measuring the oceans from space: the principles and methods of satellite oceanography. Springer. p. 279. ISBN 978-3-540-42647-9. ^ John Siegenthaler (2003). Modern hydronic heating for residential and light commercial buildings. Cengage Learning. p. 84. ISBN 978-0-7668-1637-4. ^ Peter O. Zavialov (2005). Physical oceanography of the dying Aral Sea. シュプリンガー・ジャパン株式会社. p. 27. ISBN 978-3-540-22891-2. ^ "Envisat watches for La Niña". BNSC via the Internet Wayback Machine. 2008-04-24. Archived from the original on 2008-04-24. Retrieved 2011-01-09. ^ Rainer Feistel; Günther Nausch; Norbert Wasmund (2008). State and evolution of the Baltic Sea, 1952–2005: a detailed 50-year survey of meteorology and climate, physics, chemistry, biology, and marine environment. John Wiley and Sons. p. 258. ISBN 978-0-471-97968-5. ^ Earth Observatory (2005). "Passing of Hurricanes Cools Entire Gulf". National Aeronautics and Space Administration. Archived from the original on 2006-09-30. Retrieved 2006-04-26. ^ Nidia Martínez Avellaneda (2010). The Impact of Saharan Dust on the North Atlantic Circulation. GRIN Verlag. p. 72. ISBN 978-3-640-55639-7. ^ Boyle, Edward A.; Lloyd Keigwin (5 November 1987). "North Atlantic thermohaline circulation during the past 20,000 years linked to high-latitude surface temperature" (PDF). Nature. 330 (6143): 35–40. Bibcode:1987Natur.330...35B. doi:10.1038/330035a0. Retrieved 10 February 2011. ^ Beaugrand, Grégory; Keith M. Brander; J. Alistair Lindley; Sami Souissi; Philip C. Reid (11 December 2003). "Plankton effect on cod recruitment in the North Sea". Nature. 426 (6967): 661–664. Bibcode:2003Natur.426..661B. doi:10.1038/nature02164. PMID 14668864. Retrieved 10 February 2011. ^ Beman, J. Michael; Kevin R. Arrigo; Pamela A. Matson (10 March 2005). "Agricultural runoff fuels large phytoplankton blooms in vulnerable areas of the ocean". Nature. 434 (7030): 211–214. Bibcode:2005Natur.434..211M. doi:10.1038/nature03370. PMID 15758999. Retrieved 10 February 2011. ^ "Independent NASA Satellite Measurements Confirm El Niño is Back and Strong". NASA/JPL. ^ Climate Prediction Center (2005-12-19). 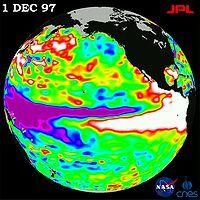 "ENSO FAQ: How often do El Niño and La Niña typically occur?". National Centers for Environmental Prediction. Retrieved 2009-07-26. ^ WW2010 (1998-04-28). "El Niño". University of Illinois at Urbana-Champaign. Retrieved 2009-07-17. ^ Webster, PJ. "Changes in tropical cyclone number, duration, and intensity in a warming environment". Gale Group. ^ Matt Menne (March 15, 2000). "Global Long-term Mean Land and Sea Surface Temperatures". National Climatic Data Center. Retrieved 2006-10-19. ^ Dian J. Gaffen-Seidel, Rebecca J. Ross and James K. Angell (November 2000). "Climatological characteristics of the tropical tropopause as revealed by radiosondes". Journal of Geophysical Research. 106 (D8): 7857–7878. Bibcode:2001JGR...106.7857S. doi:10.1029/2000JD900837. Archived from the original on May 8, 2006. Retrieved 2006-10-19. ^ Lixion Avila (2005-12-03). "Hurricane Epsilon Discussion Eighteen". National Hurricane Center. Retrieved 2010-12-14.